What do art and trails have in common? 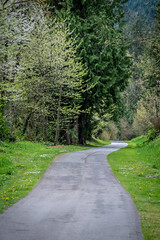 Join us this Sat, May 15 and find out, when King County Parks and 4Culture will kick off “Trails Project”, a unique summer art exhibit inspired by –and happening on– our Regional Trails System. The Saturday launch event features the exhibit’s three artists, Susan Robb, Stokley Towles, and Paul Rucker, who will lead a trek along the Soos Creek Trail. The event starts at 11:00am and lasts approximately about three hours. This should be a fantastic event with art-making, music, and performance, all inspired by our wonderful trails system. Not your average trail event! The walk starts at the corner of SE 192nd Street at 124th Avenue SE (parking lot at the northern end of the Soos Creek Trail) and continues south along the new trail segments to SE 224th Street. This is a free event, but space is limited, so RSVP as soon as possible at www.trailsproject.com.